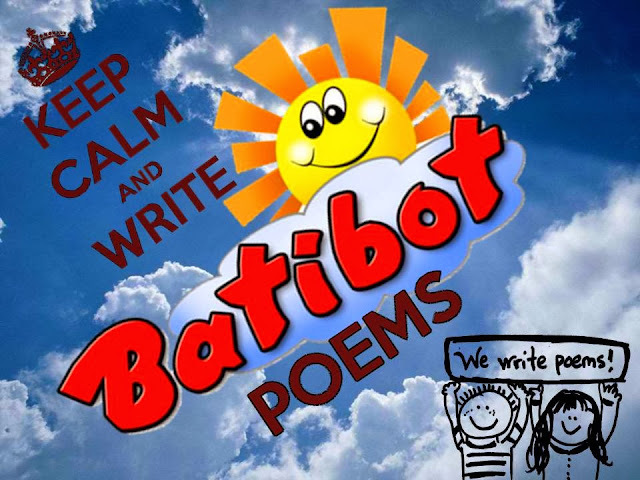 Keep Calm and Write Poems : Doon sa Batibot, Tayo na at Magsaya! They say the very first blogs were meant to share our accomplishments and success. But overall, many used it to bring out our sad experiences, our sentiments, our frustrations, and everything else in between and beyond. Imagine a world full of hatred if one has not the means to express our inner longings, our wishes, our dreams. Some of us want to tell stories vividly, incorporate plenty of photos to spice it up - after all, photos may show what words fail to do so. Some would even go through great lengths to add their own illustrations, animations, videos, and all sort of representations to elaborate on the topic. What amazes me most are those that have the patience to construct poems. Many would say that a few lines that rhyme are more creative than a lengthy essay. It becomes more personal if its written in the local language - straight from the heart, straight from the soul. Sadyang kasing-babaw ba ng dunong mo ang iyong pang-unawa? ang tuwa, ang saya - hindi ang iyong yamot! Pero parati kang nasa isip ko, tatandaan ko ito. It's really hard to write a poem. I think it's for people who has a creative mind.